Well, well, well…. somebody sure gave herself a nice long blogging break. Can I blame the polar vortex for my absence? My kids have another snow day today, making this the 19th day of Christmas break. The snow is beautiful, but -30 degrees with wind chill is insane. I may have spent some time googling real estate in the Carolinas just to keep my sanity. "In my mind, I'm going to Carolina." Seriously, I am. 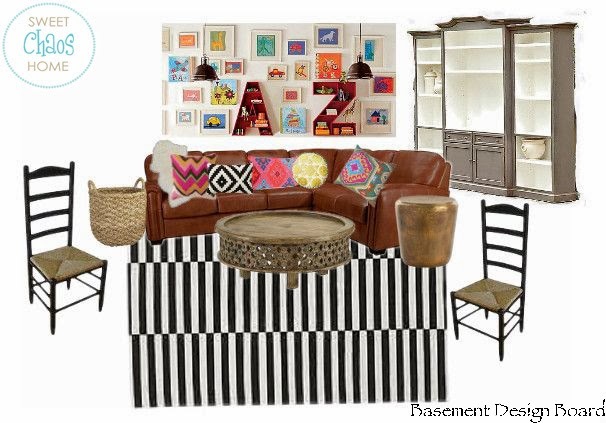 One area of our house that could use a little sprucing up is the basement. Well, like this… but with nerf gun darts and 100,000 Lego pieces on every surface. On one side of the enormous brick fireplace structure is the sitting/TV and video game playing area. On the other side is a bar, pool table and game area. Since the basement is generally the kids' turf, we tend to close the door and pretend the mess doesn't exist. However, in the winter it is nice to entertain down there where we can shoot pool or play ping pong. Obviously, I've already got the leather sectional. And I'll be adding two ladder back chairs that have been hanging around, unused, in the master bedroom. I'm planning to add some colorful pillows and a fun rug to liven up the room. I have plans to create a gallery wall with the kids' framed artwork. I'm also going to paint the oak media cabinet. It's a pretty big monstrosity, so it's gonna take a while. I don't want to spend a lot of money, so this will be a very budget-friendly makeover. I sense an IKEA road trip in my future. That is, if the snow ever melts. Hopefully, my kiddos will be back in school and I'll be back to regular blogging soon. If not, we may be looking like a scene out of The Shining soon. Happy 2014!! Hope you are keeping warm! If you live in the Carolinas, tell me how great it is there. It may be 15 years before we can actually make the move, but a girl can dream. cant wait to see it finished! love that rug! I love those large frames! Where did you find them?? Can't wait to see the updated space! It's going to look so great! Can you tell me where you found that rug? Love it! Thanks! Oh, common! Think a little bit further south. How 'bout Atl??? ?